A pantry can truly be the storage saviour of your kitchen. However, without a sound organizing method, it can quickly become an out-of-control mess that is difficult to navigate. Following a few simple steps will help you to reclaim, reorganize, and maintain your pantry like this one from House of Smiths. Isn’t it pretty! 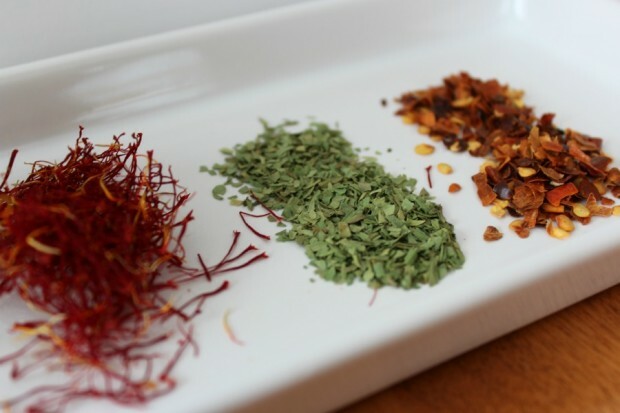 Pull everything out of your pantry onto your kitchen table, island or countertop. Leave an area open to sort items later. As you pull items out, set aside anything you no longer use or items that are broken. Toss any food items that have passed their expiry date or have been in the pantry for quite a while and are questionable. Donate any other food items you no longer want to the food bank. Divide the items you have pulled out of your pantry into themes such as small appliances, body & health, beverages, vinegars & oils, baking, sweet snacks, salty snacks, canned meals, canned vegetables, canned fruits, breakfast, seasonings, etc. Give each theme a name that makes sense to you and your family. Create a plan or map for how your themes are going to be placed back in the pantry. Keep regularly used items at eye level and items you don’t want the kids to get into out of reach. For instance, I have all my small appliances on the top shelf because I don’t use them regularly. As an option, you could use a vertical area on the left side of your pantry instead if you need better access. I have the breakfast and snack items at eye level because they are needed everyday. Purchase storage containers, baskets or bins to keep your themes as a unit. 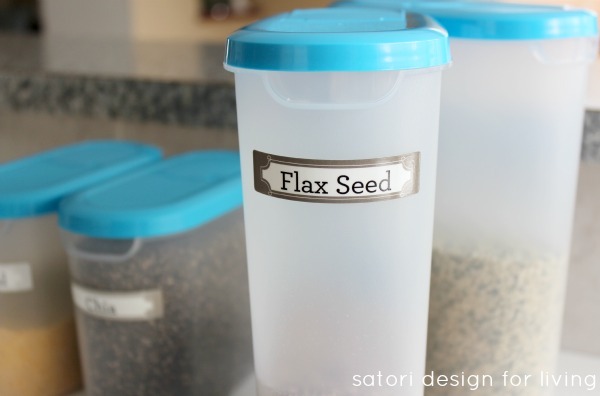 I like to use the inexpensive clear storage containers from Ikea called SAMLA in varying sizes, with and without lids. It keeps everything visible, yet contained. For baking supplies, such as sugar and flour, transfer from the bag into an airtight container. 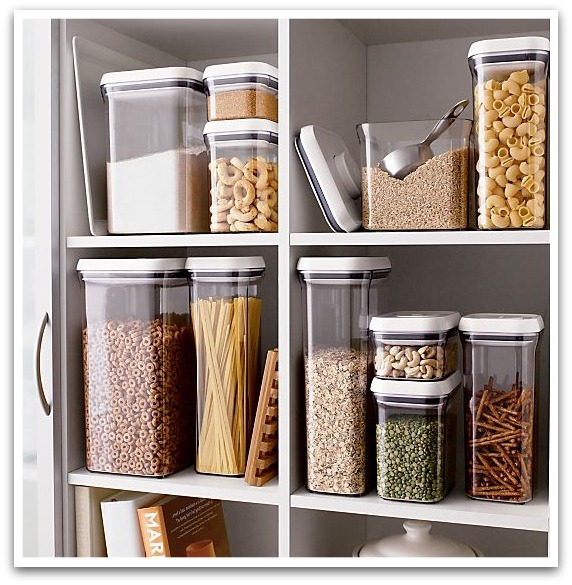 Stackable containers allow you to use space effectively. Make sure you label all storage containers. And then there’s this pantry storage system I’m coveting! Use your themes to create your weekly/bi-weekly grocery list. Sections that appear empty will signify those items that need to be replenished. In addition, if a section is spilling over, then you know you have over bought and these items should be cut back or stored in another area of the home, such as a designated shelf in the basement. Create meal plans based on items you have too much of until they are downsized. Note: I don’t recommend stocking up on too many items at one time. If they are staples, that’s okay. Otherwise, don’t fall in to the sale or special offer trap. As your needs change, (for example as children grow) you can change, add or delete themes. Be sure to make new labels. At least twice per year, go through the pantry and remove items you no longer need or food items that have expired. 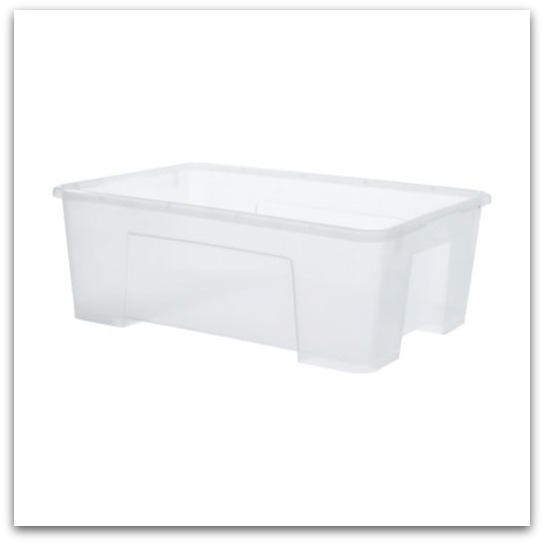 Wipe down all plastic storage containers. Organizing your pantry may take a few hours, but the results are well worth it! I’d love to hear your tips for an organized pantry. Want to tackle more kitchen organization? Check out these posts too! Not overbuying is key to the pantry. We are empty nesters now and Hubs consistently shops at Costco, I love the idea of purchasing smaller sizes so we can have variety without so much bulk everyday food items.